If you think life with a newborn is all spit-up dotted shirts, mum buns and floppy pants, you’d be partly right. But there’s also plenty of opportunity to bring your own cute style to the table (when you manage to actually leave the house!). Simplifying with style is the key, ensuring you spend less time getting ready, but plan cleverly for the best results. Planning ahead and getting a versatile, long-lasting and stylish haircut and/or colour will save you heaps of time getting yourself ready to face the world. It also helps you feel a little more put together, which can provide a little boost in the confidence stakes. Talk to your hairdresser about your needs and let them know that it may be months between visits, so you need something low maintenance that will endure. Some nice sneakers, boots or sandals (weather depending) for treading the pavement with your bub will keep you feeling comfy and capable – and looking a little bit fancier too. Invest in the nicest quality you can afford, to ensure they’ll stand up to mum life demands. 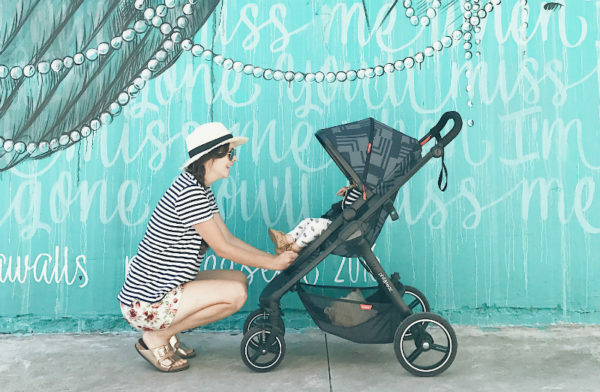 A good looking and practical pram is a must for any mum, of course, but if you choose wisely it can be a style statement too! Select something that reflects your own personal style and ticks all the design and function boxes. The phil&teds mod is a great place to start – it looks great, it’s totally adaptable and it’s superslim so you’ll be able to squeeze through all the tight spaces you’re used to. Nappy bags have come a long way since the days of quilted lemon totes with storks on them. Now, there’s a whole host of stylish choices to ponder and something to suit every kind of mum. Look for quality construction, plenty of helpful pockets, generous size, comfort when carrying AND easy clean features when you’re shopping for yours. New baby, new style? If you’ve got a wardrobe full of things that don’t seem to fit or things you have no desire to wear, maybe it’s time to narrow things down and splash out on a limited, but easy to wear, capsule wardrobe? Here’s some great advice on pulling together your own stylish but small range of looks. You could also put together a capsule range using a few of your existing pieces and some stylish op shop finds, if you are on a tight budget, post-bub. A bright scarf, some sparkly earrings, adorable socks, snazzy sunglasses. These little touches can add a bit of style zing to an otherwise simple outfit. Keep your eyes out for colourful or on-trend pieces that won’t break the bank (and that your baby won’t break!). Not gonna lie, your baby is a very adorable extension of your own personal style. They’re a tiny person who cannot (and let’s face it, should not) reject your style choices for several years yet. Take this opportunity to share your look mum-and-kiddo style and you’ll be congratulating yourself on the matchy-matchy cuteness for years to come. If you’re looking for daily inspiration in the mum style stakes, head to Instagram and take a peek at hashtags like #everydaystyle #mumstyle or #instamum for even more bright style ideas!